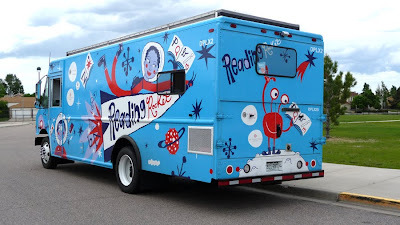 This ain't no regular bookmobile... it is a g'damn ReaDINg ROCkeT. Denver Public Library has not 1 but 2 Reading Rockets illustrated by Nate Williams; photos above reproduced with his permission [thx, Nate]. (If you are a Boston-crafty type you will recognize his style in the upcoming SoWa Open Market posters.) Nate's rocket design was among the winners of the AIGA Cause/Effect Award in 2009 and it is a real treat. 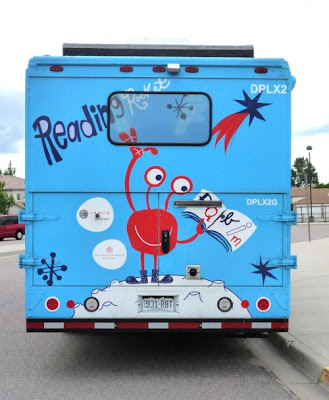 But, here the bookmobiles are not just icing on the librarycake; some Denver public schools lack funding to provide library access thus the Reading Rocket brings books (and a shot of excitement about reading) directly to the underserved schools. Each one of the bio-diesel powered vehicles is handicap-accessible, and both feature two computer stations and can hold up to 3,000 books, CDs and DVDs. 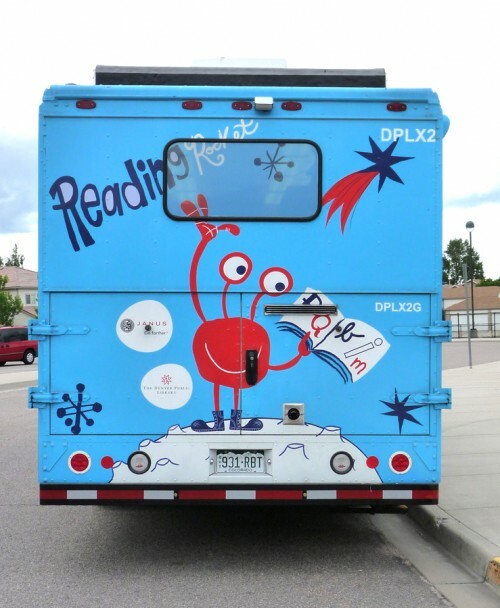 The two Reading Rocket bookmobiles were generously donated by the Denver-based asset management firm, Janus Capital Group. Further reading.